From the late 12th Century onwards Heralds have been connected with the households of rulers and important nobles. They originally acted as messengers, diplomats and army staff officers. They were required to be able to identify the devices painted on the banners, shields and coats of army commanders. Heralds also organised tournaments and gradually became involved in ceremonial occasions. In 1484 the Heralds received their first Charter of Incorporation from King Richard III. Queen Mary Tudor gave the present site for the College of Arms in 1555. However half this land is now covered by Queen Victoria Street. There are thirteen Officers of Arms who form the College today. The Heralds come under the direction of the Earl Marshal who is the Duke of Norfolk. The Dukes of Norfolk have had the hereditary title of Earl Marshal since 1672. The highest ranking Heralds are called Kings of Arms, followed by Heralds and Pursuivants. The three Kings of Arms are called Garter, Clarenceux and Norroy & Ulster (amalgamated in 1943). The six Heralds are called Windsor, Chester, Lancaster, York, Richmond and Somerset. The four Pursuivants are called Rouge Croix, Bluemantle, Rouge Dragon and Portcullis. Currently the positions of Lancaster and Rouge Dragon are vacant. Usually to become an Officer of Arms one starts as a researcher working for an Officer. The researcher then progresses up through the system starting as a Pursuivant. The Earl Marshal and Officers of Arms, are responsible for arranging the opening of Parliament, coronations, state funerals and the annual Service and Procession of the Order of the Garter, which is held at Windsor Castle. Garter King of Arms is also responsible for the introduction of new peers into the House of Lords. The Heralds have private practices where they undertake research into genealogical matters, including the right to assume existing coats of arms and requests for grants of arms. A right to have a coat of arms by inheritance can be established only by proof of a direct male line descent from an ancestor who is recorded previously with a coat of arms. Many people are interested in their family history and the Heralds undertake research on their behalf. In addition to their private work they receive a small sum of money from the Queen for their services during state occasions. The original college building on this site was destroyed in the Great Fire but the records were saved and returned to the current building which was built between 1671-88. 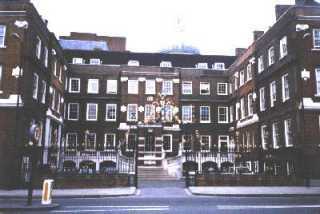 The main rooms of the College of Arms are raised above the level of the ground and a fine set of stone steps leads to the Earl Marshal's Court (sometimes known as the Court of Chivalry). This is the principal room in the building being two floors high, with a gallery and throne. 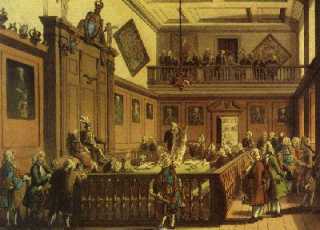 The record keeping of coats and arms involves the recording of family history. Over the centuries a unique collection of armorial and family records has been formed. The library records are very large and diverse, ranging from original early Heralds' Visitations to modern case bound periodicals. Also included are both printed and manuscript books, including parchment manuscripts with ancient seals. The collections has been repaired over many years and it is now a constant battle to keep the ever increasing collection in good order. The college of Arms is totally self-financing and receives no state funding. As with so many libraries, raising money to continue conservation work is always a problem. The conservation Department currently consists of one full-time member, three part-time members and a volunteer. Working in the Conservation Department requires a knowledge of a range of conservation matters and there is a great deal of work to be done due to the continual use of the books and documents. The Department also undertakes the conservation of illustrated prints, framed manuscripts and occasionally simple water-colour paintings. Whilst priority is given to the College of Arms library, a small amount of work for private clients is also undertaken. A plan for the future is to conduct a survey of the collection, recording the state of each item. As a result it is hoped that a picture of the general condition of the library will be achieved. This will make it possible to establish a record of the material requiring attention in the future. Colin Meays has been involved in bookbinding for the past ten years and received formal training at Brunel College of Technology Bristol (1990-92), gaining Advanced City and Guilds in Bookbinding, Book Restoration and Paper Conservation and also the Brunel College Diploma Certificate. In 1991 he was awarded the prize for best work in the first year at Brunel. He then studied at Camberwell College of Arts undertaking the Conservation Honours degree course (1992-95). In 1994 winning the second price of the Stationers Company for an outstanding example of forwarding which was judged by Zaehnsdorf Ltd. Currently he is Head of Conservation at the College of Arms, London.